Beautiful family villa, superb views, 5 minutes walk to the beach. Villa Kali Thea is a modern, beautifully maintained family villa with stunning mountain and sea views. It is located in a fantastic rural location next to a national park and a number of superb beaches. It has been individually designed and built by one of the best architects on Naxos and provides modern, light and airy accommodation sleeping 4/5 + a cot. The villa is our family holiday home and therefore we have thoughtfully furnished and equipped it for our own needs as well as that of our guests to provide a real 'home from home'. There are 2 ground floor bedrooms, 1 has a king-sized bed and spacious en-suite shower room, the other has twin beds. Both have air-conditioning, ceiling fans, built-in wardrobes/drawers and patio doors opening onto a terrace with ample space to sit or sunbathe. The upstairs open plan kitchen/dining/living area is a light, airy space with stunning mountain and sea views and a large balcony terrace. There is also a lower covered terrace and garden. Our Local Agent: The rental rates include the following services of our local agents, an English lady who has lived on Naxos for many years. For a relaxing start to your holiday she can meet you at the port or airport on your arrival. She can help transfer you directly to the villa or, if you are hiring a car, they can help with the transfer of your luggage and accompany you to the villa. She will then familiarise you with the property and the surrounding area and act as an emergency contact for the duration of your stay. We can provide good maps / directions for independent travellers. Our agent can also help with the pre-booking of a hire car. We are an English couple who loved travelling for many years including hopping around the Greek Islands. However we continually found that we kept wanting to return to beautiful Naxos year on year hence our decision when our family came along to build our own Villa. We have been travelling to Naxos for many years and loved the beaches and friendliness of the Naxian people. As we started our own family we decided to buy a plot of land and build our own Villa. By doing so we have been able to develop a property that is just perfect for us and indeed for our guests. It provides the perfect family home in the beautiful surroundings of the stunning Greek islands! We have built the property to take advantage of the fantastic views to the local beaches and across the Aegean towards Santorini, Ios, Paros and the other local Cycladic Islands. Whilst in a small development of Villas the property retains its privacy and is safe for families to enjoy the local countryside. Lovely house and beautiful surroundings! The house is absolutely gorgeous. 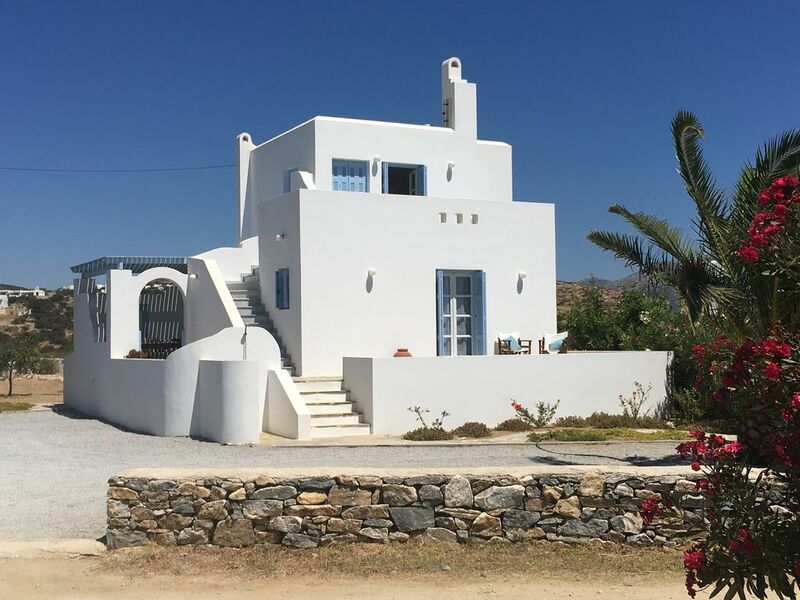 This lovely white greek house has basically everything you need to enjoy your holiday in the Naxos countryside. We felt at home the moment we stepped foot on the property. It has two lovely and spacious bedrooms, both of them above average when it comes to comfort. There are two bathrooms as well. The kitchen has all amenities you need. The house has great standard, it is well-preserved and very clean. The house is situated in a quiet area surrounded by similar villas and meadows where we could spot cows and goats. In the area there are a lot of colourful flowers and olive trees, and there is a staircase leading up to the terrace on the 2nd floor. The terrace is spacious, giving you the opportunity to eat and relax. Sitting there in the evenings watching the sunset and looking at the sea was one of the highlights during the stay. There is a great taverna and beautiful beaches in walking distance. We highly recommend this house and its surroundings, because it is balsam to your soul and body. You will feel better in every way after visiting this place. We are so pleased that you found the Villa & location to be everything you wanted for your holiday- it really is wonderful and we are happy to have shared it with you! We look forward to welcoming you back in the future- you'll be most welcome! This lovely villa was perfected located and equipped for a relaxing island holiday. Everything about staying here was made easy from the booking, arriving, staying, leaving to deposit return. Both Sarah (owner) and Barbara (Island rep) was very communicative and helpful and took all the stress away of planning a trip away with a young child. The villa was a joy to stay in and had everything you needed to enjoy the stay there. Little things like extra adaptors for night lights, walking maps and guide books. Well equipped kitchen and comfortable furniture. It was nice being an upside down layout so you could enjoy the terrace and views from the upstairs lounge and patio while little one was in bed downstairs. The beaches close by were amazing and so quiet while we were there. Easy access and gorgeous clear water. The Taverna v close by had very tasty local food and they let us use their pool for free. The location of the villa made it very easy to drive up into the mountains for walking and biking and exploring so lots to do if you didn't feel like sitting around the whole time. Really handy that there was a market close by but it was very expensive so we would recommend stocking up in the main town before heading to the villa. We had a wonderful stay here and would definitely recommend it to other people looking to stay on this lovely Greek island. The villa was exactly what we expected, all the equipment you could need (IF youwanted to stay in and cook) and in a very quiet agricultural area. One taverna was very close by and three others within walking distance if you like walking, which was a great way to walk off the calories from our meals. Lovely beaches all round. It was unexpectedly hot on our first week so I appreciated the shaded terrace downstairs to cool off while my husband roasted upstairs in the sun. Would definitely go back again. Thank you very much for your kind comments. We have always tried to ensure guests know what to expect when they arrive at Villa Kali Thea, we are glad you found it as we described- you'll be most welcome back at Villa Kali Thea should you return to Naxos again in future years. We spent a week at Villa Kali Thea. The villa was very clean, comfortable and very well equipped. Barbara, who looks after it, was very helpful and knowledgeable about the island.Nothing was too much trouble. The owners arranged car hire for us which was waiting at the airport when we arrived. The weather was very good and the island was quiet which we prefer. We explored all over and saw some spectacular scenery, there are lovely beaches nearby. There are excellent restaurants within easy distance. The balcony was great for breakfast, sitting in the sun or watching the sunset. We certainly hope to return in the near future. Our stay was absolutely perfect from day one, the owner's agent having booked a car which was waiting for us at the port. Every detail was explained to us and we were given all the necessary information about good tavernas and stores around. The house is lovely, very well maintained, and is exactly as described in the listing. It is very well equipped (from barbecue to beach towels), and within walking distance to beautiful sand beaches. Only negative point : our stay was too short! We surely would recommend the villa and would love to go back there for a longer period! Clean, very well equipped and well-mainted, best house, best host, best service we ever had. If we choose Naxos again for holidays, we'll take this villa. Villa Kali Thea is highly recommended. Alyko is a peaceful and relaxed setting that benefits not only from a wonderful countryside location with stunning mountain views, but also just a 5 minute walk from the villa brings you to the beautiful sweeping bay that consists of the lovely sandy beaches of Gylfada, Kastraki & Mikra Vigla. The headland adjacent to the beach has been designated a nature reserve, this has allowed the area to maintain its natural rugged beauty. On the way to the beach there is a very good family run taverna with a large swimming pool. Further tavernas, small supermarkets, bakeries and beautiful beaches are within walking distance or 5-10 min drive. This is also an ideal base to explore the island from. With its fabulous beaches, picturesque villages, imposing mountains, lush valleys & historical sites, Naxos has something for everyone. Activities such as windsurfing, kite surfing, diving, cycling, walking & horse riding are all available locally.